Room size was great, friendly staff and very helpful. The staff are really helpful, nothing to complain about. Location excellent, rooms clean and staff terrific. no problems with this hotel at all. This hotel exceeded my expectations. Amazing staff, pool, facilities, and rooms! Everything...so much so we have booked again for just after Christmas. lovely room, great view, great staff, clean and 5 star all the way! Room layout is great- and you can’t beat the location! We were upgraded to a suite which was nice but pretty pointless as we were only staying the night after attending a birthday in the city. Nice room, but with most of these city motels no fresh air, only AC. 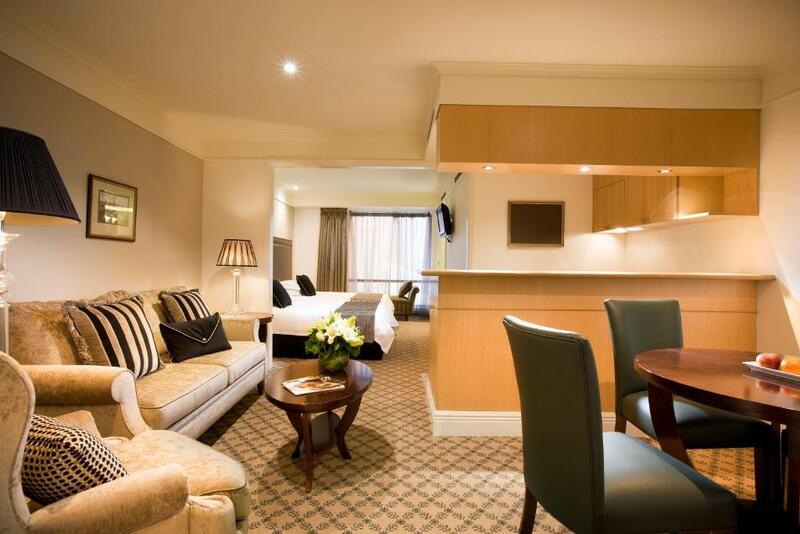 Lock in a great price for Stamford Plaza Melbourne – rated 8.5 by recent guests! Stamford Plaza Melbourne This rating is a reflection of how the property compares to the industry standard when it comes to price, facilities and services available. It's based on a self-evaluation by the property. Use this rating to help choose your stay! One of our top picks in Melbourne.Located in the heart of Melbourne CBD, Stamford Plaza Melbourne is a traditional, 5-star hotel, offering a rooftop heated pool, Jacuzzi, sauna and a well-equipped fitness center. Guests staying at Stamford Plaza Melbourne can choose to stay in rooms, built in 2016 with modern tiled bathrooms that have walk-in showers or to stay in more traditional style 1 or 2-bedroom guest suites with kitchenettes or fully equipped kitchens and separate marble bathrooms. All accommodations has electronic key card locks and door peepholes. You can dine at Harry's Bar and Restaurant, which offers innovative, seasonal, food and beverage options, or order room service from the extensive 24-hour in-room dining menu. Stamford Plaza Melbourne is 2 minutes' walk from Collins Street's high-end boutique shops and 20 minutes' walk from Melbourne's international sporting precincts, including the MCG, Rod Laver Arena and AAMI Park soccer stadium. China Town and a range of rooftop bars and lane-way's with dining options are all within minutes of the hotel. 뀐 Located in the real heart of Melbourne, this property has an excellent location score of 9.0! 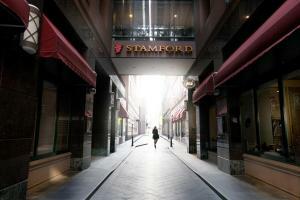 When would you like to stay at Stamford Plaza Melbourne? This contemporary, spacious suite features a living and dining area and bedroom with private bathroom boasting a spa bath. There is a well-equipped kitchen including a microwave, stovetop, dishwasher, mini bar and tea/coffee making facilities. A bathrobe and slippers are included. The One-Bedroom Suite can be converted into a Two-Bedroom Suite via a connecting door to the Studio Suite. Available upon request. The 2-bedroom suite features 2 separate bedrooms with private bathrooms. There is a fully equipped kitchen including a stovetop, microwave, dishwasher, refrigerator and tea/coffee making facilities. Bathrobes and slippers are included. Selected two bedroom suites have two separate entrances. This studio features a dining area and galley style kitchen equipped with a microwave, mini-bar and tea/coffee making facilities. There is a zoned living area with a separate bedroom with private bathroom boasting a spa bath. There are 2 TVs available. The Studio Suite can be converted into a Two-Bedroom Suite via a connecting door to the One Bedroom Queen Suite. Available upon request. This spacious suite features a living and dining area and bedroom. There is a well-equipped kitchen including a microwave, stovetop, dishwasher, mini bar and tea/coffee making facilities. This spacious suite features a living and dining area and bedroom with king bed. There is an private bathroom boasting a spa bath. There is a well-equipped kitchen including a microwave, stovetop, dishwasher, mini bar and tea/coffee making facilities. This spacious, two-story penthouse suite overlooks Melbourne CBD and features a separate dining area. The suite features a fully equipped kitchen including a microwave, refrigerator, stovetop and tea/coffee making facilities. Guests can relax in the lounge area featuring a flat-screen TV. Bedroom Suite. This will be collected by credit card and refunded in full, subject to an inspection of the property. The presidential suite features a Manhattan loft style duplex featuring panoramic views of Melbourne's CBD. The suite consists of 2 bedrooms and 2 bathrooms, one with a spa bath as well as a separate powder room. There is a fully equipped kitchen including microwave, toaster and tea/coffee making facilities. Please note a damage deposit of AUD 200 per night is required for the Presidential Two-Bedroom Suite. This will be collected by credit card and refunded in full, subject to an inspection of the property. This spacious one-bedroom suite features a living and dining area and bedroom. There is a well-equipped kitchen including a microwave, stovetop, dishwasher, mini bar and tea/coffee making facilities. This contemporary, air-conditioned double room features an abundance of natural light through the floor-to-ceiling windows. This room features a bathroom with a large walk in shower as well as a wardrobe. There is a 48-inch TV with cable and pay-per-view channels for guests to enjoy as well as a work desk. Tea/coffee making facilities and a mini-bar is also available. This suite has a sofa, air conditioning and dishwasher. Please note a damage deposit of AUD 200 per night is required for the Three-Bedroom Suite. This will be collected by credit card and refunded in full, subject to an inspection of the property. 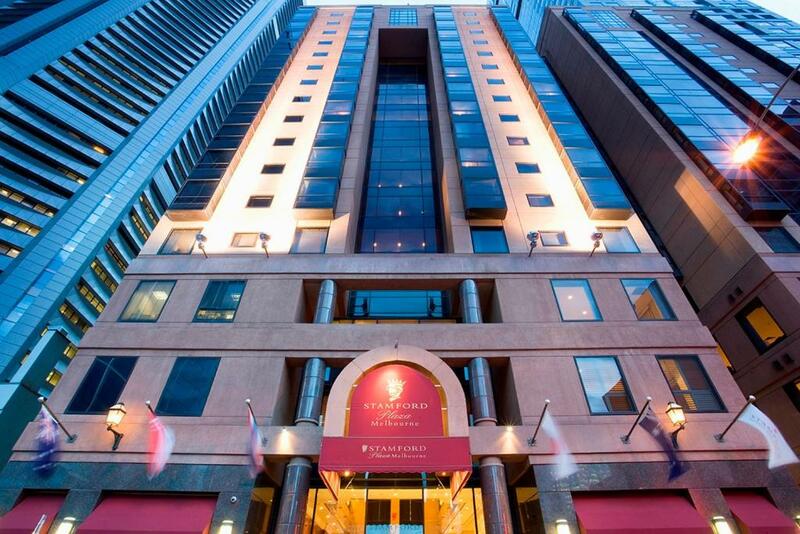 Stamford Plaza Melbourne was first opened on the 25th of October, 1990 as one of the first all-suite hotels in Melbourne. Prior to the property becoming an accommodation establishment, the land and buildings were used as a Japanese Restaurant, a Newspaper Boys Club and one of Melbourne’s first gymnasiums. 111 Little Collins Street first wore the Stamford name (from Sir Stamford Raffles, the founder of Singapore and a great pioneer) on December 1, 1995, being called the Stamford Plaza Melbourne. Our friendly staff is keen on creating guests' memorable experiences. 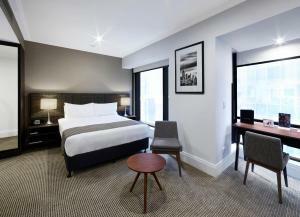 Located at the “Paris” end of Little Collins Street, Stamford Plaza Melbourne is the ideal choice for guests looking for quality accommodation in Melbourne’s central business district. Set amongst theatres, renowned restaurants, fashion boutiques and Melbourne’s finest attractions, guests can relax in the boutique surroundings whilst immersing themselves in the city’s vibrant culture. House Rules Stamford Plaza Melbourne takes special requests – add in the next step! Stamford Plaza Melbourne accepts these cards and reserves the right to temporarily hold an amount prior to arrival. Please note that there is a 1.52% charge when you pay with a Mastercard or Visa credit card. Please note that there is a 1.52% charge when you pay with an American Express credit card. Please note that there is a 3.44% charge when you pay with a Diners Club credit card. Please note that there is a 1.76% charge when you pay with a Union Pay credit card. Please note the damage deposit for the Presidential Two-Bedroom Suite, the Penthouse Two-Bedroom Suite and the Three-Bedroom Suite is AUD 200 per night. This will be collected by credit card and refunded in full, subject to an inspection of the property. For all other accommodations types, a damage deposit of AUD 100 per night is required. This will be collected by credit card. You should be reimbursed within 7 days of check-out. Your deposit will be refunded in full via credit card, subject to an inspection of the property. Breakfast was great and had the only staff member that could speak clear English. No view. Narrow street although this also means less traffic. Rooms are a little aged with limited storage space for clothes for a long weekend. Value for money. Convenient location. Excellent facilities including pool, spa, bar and restaurant. Plus Kitchenette in unit. Large room. the radio system was not working and could not listen to music. called staff to help and they came and said sorry i can’t fix it and walked off. staff could’ve replaced it but they seemed to be in a rush as they only took less than a minute to try and fix. small gym. house keeping. - stayed for 3 nights and not once did someone come to clean. was out from 11am-6pm two days in a row and had my make up room light on but no one showed up to clean. good location, great staff, nice spa. excellent room excellent service top marks for Stamford plaza. The spacious room, well equipped bathroom, buffet breakfast. Our first room had plumbing issues, however they upgraded us to a suite.